You can find Rick and Molly in San Diego or Point Arena or flying away from the Montgomery Field airport! Or use Google maps to create your own driving instructions to 4328 Piedmont Drive. Montgomery Field is located between CA-163 (west) and I-15 (east) and Balboa Ave (north) and Aero Drive (south). My hangar has a small #30 on the big door located in the last row to the west -- it is the 7th of 10 hangars counting from the south (click on the photo for a larger version). 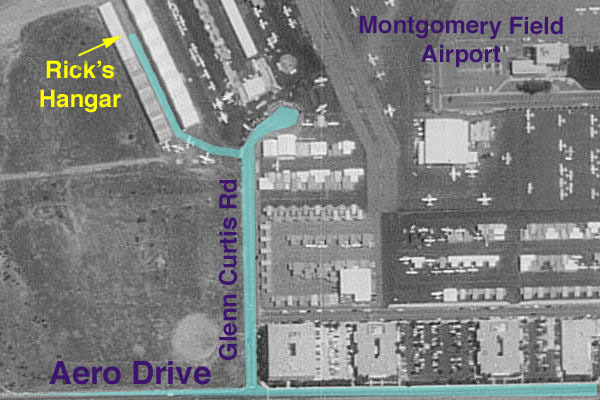 Enter the airport grounds through a driveway off Glen Curtiss Road (careful of the abrupt slope for low-slung cars!). There are now vehicle gates that require you to enter a code to drive onto the airport -- call me for the gate code. After the entering the gate, drive to the last row of hangars. Imagine, covered parking inside my hangar! Click for a link to an on-line map and get directions from wherever you're coming. (Note: do not use as a mailing address! Click on the address link above for an online aerial photo and map of the general area. Click here to get a online aerial photo and map of our home site in the hills above Point Arena. The map can give you driving instructions that get you close, but you'll need more detailed instructions to get the right dirt road, deal with the locked gate, and drive down our unimproved driveway. 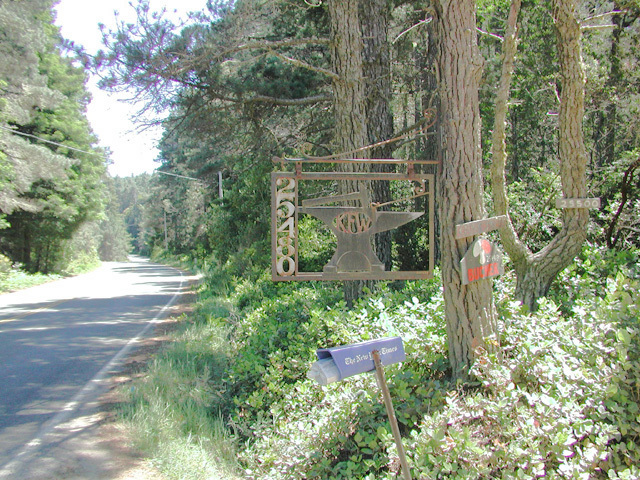 If you tavel NORTH on HIGHWAY 1, you will pass through the Sea Ranch and cross the Gualala River bridge to the town of GUALALA, then drive through town and just beyond the 1.43 mile marker, turn RIGHT (EAST) on PACIFIC WOODS. Zero your trip meter here. Go 1.3 miles to a stop sign at a T-intersection and turn LEFT (NORTH) onto OLD STAGE ROAD. At 4.9 miles continue past Fish Rock Road on your left and then a bit further past Fish Rock Road again on your right (who knows why?). Continue but note that the road name changes to IVERSON ROAD. At 6.8 miles at the signed intersection turn RIGHT (NORTH) downhill onto TEN MILE ROAD. At 11.2 miles is our road, which is marked by a dark (and hard to see) metal sign for Kentucky Forge Works (KFW) at 25480 TEN MILE ROAD (you would be looking at the back side of the photo above). Driving our dirt road -- CAUTION! If the weather is good but you don't want to risk your car to unimproved roads, or if the weather is bad and you don't have a 4x4 vehicle, then plan on parking on the EAST side of TEN MILE ROAD, across from the sign, and wait for us to get you in our black Toyota 4x4 pickup truck. Otherwise, turn WEST onto the dirt road and travel 0.5 miles where you will drive under a powerline, then immediately take the RIGHT FORK over our culvert and drive up to the gate. If the gate is locked, you can park and walk 0.5 miles to our trailer. Otherwise, drive with caution because the road is occasionally quite rough, no faster than 15 mph, 10 mph is better. Keep to the LEFT at every opportunity. The last hill as you enter our home site is at least a 10% grade uphill so be prepared -- best to shift into your lowest gear before attempting the climb! Click on the image to see more pictures of our property.